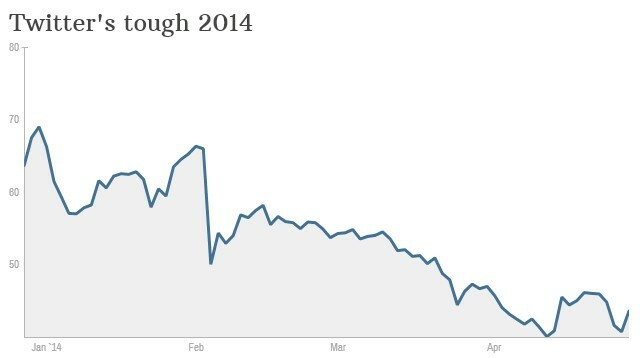 Investors are starting to lose patience with Twitter. Shares sank nearly 9% in after-hours trading Tuesday following uninspiring first-quarter results from the social-media company. Twitter's active-user base is still growing, hitting 255 million as of last month. But that was only a 6% increase from the previous quarter -- not the breakneck pace that investors have come to expect from young social media companies. Twitter (TWTR) booked $250 million in sales for the first quarter, but it still wasn't profitable, losing $132 million. Both revenue and Twitter's quarterly loss managed to beat Wall Street analysts' forecasts. But Twitter's outlook wasn't much to be excited about: The company expects sales to rise only modestly to between $270 million and $280 million in the current quarter. That's in line with analysts' expectations, but investors were clearly hoping for more. Twitter has been one of the biggest losers in this year's downturn for tech stocks, falling over 30% since the start of 2014. It is the second-worst performer in CNNMoney's Tech 30 index. The stock surged over 70% on during its debut on the New York Stock exchange in November to $44.90, but was down to $43.03 as of Tuesday's close.